Ivy Air. Sounds like an airline, but it is the newest generation of Apple's successful subnotebooks. We tested the entry-level model featuring a 13.3-inch screen and Intel's Core i5. Its exterior is - as always - (virtually) nothing new. This revised 13in MacBook Air is a little bit faster in general speed, a lot faster in graphics speed – if only catching up with 2010’s Air – but with approaching an hour of extra battery life. We also appreciate the even quieter fan. This is the original ultrabook, and with extra details and quality touches it still beats all Ultrabooks we’ve seen so far. With a design that never seems to date and an impeccable finish, the 2012 13" MacBook Air packs excellent levels of processing power and a monster battery life into a sleek, compact casing. The new MacBook Air has so many great features that you'll soon get over the fact that its screen isn't quite as good as the displays in certain rivals (although it's still above average) and that it's lacking a few connections. Tweaks to the innards of the Macbook Air, especially the inclusion of 4GB of memory and USB3 as standard, have made this an even better laptop than before. It is still expensive – this model costs £999 – but it is excellent value if you need a lightweight laptop. For all the Ultrabooks we've seen, none can quite match the Macbook Air. The MacBook Air is in its third iteration of the current design and it's tangibly better than the two that came before it. The 2010 (and older) models are just plain slow by comparison. Thanks to architectural, frequency and thermal improvements, one of the cores from a 2012 MacBook Air ends up being faster than two from a 2010 MBA. In other words, the 2012 models end up being more than twice as fast as the 2010 models in many of our CPU bound tests. The mid-2012 MacBook Air is a very solid offering and continues to be a target for many notebook manufacturers, and for good reason. Four years after its unveiling, the Air is still one of the sexiest notebooks on the market and with the recent slight price adjustment, it seems to be competing well even on value terms. Intel is likely to put some extra pressure on the Air with second and third generation ultrabooks, many of which are shaping up to be real contenders, at least on paper. But even still, the Air is the system that all other Windows ultrabooks strive to be like and that’s quite the complement. We aren't sure what has happened, but it very much appears that Apple laptops are no longer all that much more expensive than a decent PC. The Dell XPS 13 uses older tech, but still costs nearly the same as this 13-inch Air. Arguably, the Air offers a lot of advantages too. The screen is 16:10, which, for most computer use is far better than that stupid 16:9 ratio, foisted upon us by HD television. Apple has updated what was already one of the better ultraportable laptops on the market to keep it competitive, with a downright impressive set of specification upgrades and (in theory) some of the best connectivity going thanks to its dual USB 3.0 and Thunderbolt combination. However, we can’t say we’re not disappointed to have the same old 1,440 x 900 TN screen rather than an IPS-panel Retina display, especially since some of the competition will be packing 1,600 x 900 or even 1080p IPS screens on their premium 13in Ultrabooks. Apple has given the MacBook Pro 13-inch some real improvements, and the end result is a laptop that's worth buying—if you're due for a new one anyway. Owners of the previous MacBook Pro 13-inch (Late 2011) or the previous MacBook Pro 13-inch (Thunderbolt) may want to stick with the current model. Last year's model upgraded to second-generation Core processors from the two-year old Core Duo, which saw much more dramatic improvements in performance. It's easy for us to recommend the newest MacBook Air, because it's a fantastic machine. But, unlike this time last year, there are other impressive lightweight options out there. So be sure to check out our Best Ultrabook feature and reviews to see if the MacBook Air is the right ultra-portable notebook for you. Apple's MacBook Air 13 refresh may be most notable for its $100 price drop from last years model but this ultrathin and light design that is several years old still holds up well even compared to the onslaught of competition from the second generation of ultrabooks. Performance has improved as has battery life thanks to the new Ivy Bridge based dual core processor. Storage and memory remain unchanged but now external expansion is improved with USB 3.0. Not too long ago, the MacBook Air practically stood alone in the computer landscape with its unique blend of design, size, and performance, an improvement on the thin laptop with low-voltage CPU. This year's MacBook Air opts for gradual improvements rather than anything revolutionary, but lowered prices continue to make it the go-to mainstream recommendation for any MacBook owner-to-be. At first blush, the MacBook Air doesn't appear to have changed much between 2011 and 2012: it looks exactly the same, save for those USB 3.0 ports and new MagSafe2 connector, and even the 50Wh battery remains unchanged. As for those faster Ivy Bridge processors, well, every PC maker is refreshing their Ultrabooks with Intel's new chips, if they haven't already. With the PC industry throwing every ultrabook it can come up with at the market in the hope of scoring a win, Apple has done exactly what it needs to with the MacBook Air. Faster, more flexible and cheaper, it presents the strongest challenge from an Air model to-date. That’s certainly enough to leave it as our choice of ultraportable notebook. The 13-inch MacBook Air remains our favorite ultraportable notebook. In addition to best-in-class ergonomics, loud speakers and a svelte profile, you now get faster performance and much longer battery life than the Ultrabook competition for $100 less than before. The only reason we dropped the rating from a perfect 5 stars to 4.5 stars is because some Ultrabooks offer higher-resolution screens and more compact designs. 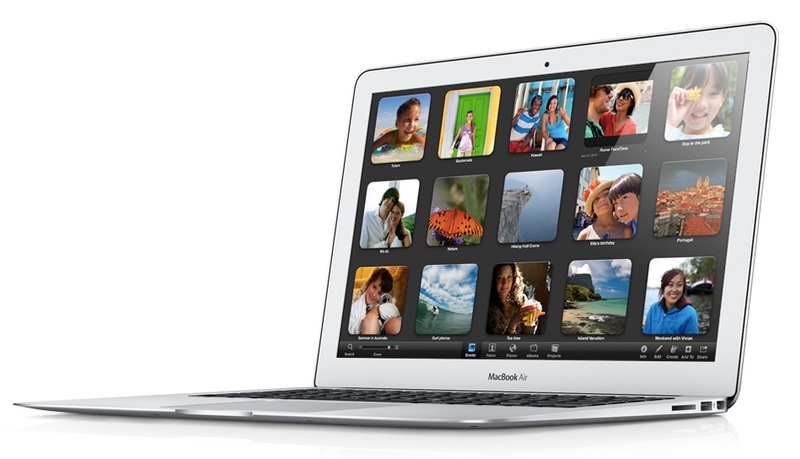 The new Apple MacBook Air 13-inch (Mid 2012) is a simple upgrade of the class-leading line, with a $100 price drop. Although a new processor gives you a little extra performance and some tests, the real additions are things like the new (for Mac) USB 3.0 ports and free upgrade to OS X Mountain Lion. Few companies generate anything like the buzz that Apple does for its new products, with rumours flying around months before an official announcement is made. The new 13-inch Apple MacBook Air is as thin and stunningly designed as ever, but it's now packing the latest Intel Ivy Bridge processor, making it more formidable for graphics tasks and bringing those all-important high-speed USB 3.0 ports. It's still going to cost you a pretty penny though. When it first launched in 2008, Apple’s sleek and skinny MacBook Air didn’t have much competition in the premium ultraportable market. With an Intel Ivy Bridge CPU and speedy USB 3.0 ports, Apple’s latest Air is still a strong candidate for best ultraportable available. But with the same chassis and screen resolution as last year’s models, it’s not the class-leader-by-a-mile that the previous version was. And that’s it. If you bought a MacBook Air last year, there frankly isn’t enough here to warrant an upgrade, but if you didn’t, there’s one more treat in store: it’s now £999 for the 128GB model and £1,249 for 256GB, down £100 in both cases. It was an attractive enough proposition before, but the 2012 model sets the bar exceedingly high for the impending wave of Ivy Bridge Ultrabooks. Apple has updated what was already one of the better ultraportable laptops on the market to keep it competitive, with an impressive set of specification upgrades and the best connectivity going thanks to its dual USB 3.0 and Thunderbolt combination. However, we can’t say we’re not disappointed to have the same old screen rather than an IPS-panel Retina display, especially since some of the competition will be packing 1080p IPS screens on 11- and 13in Ultrabooks. 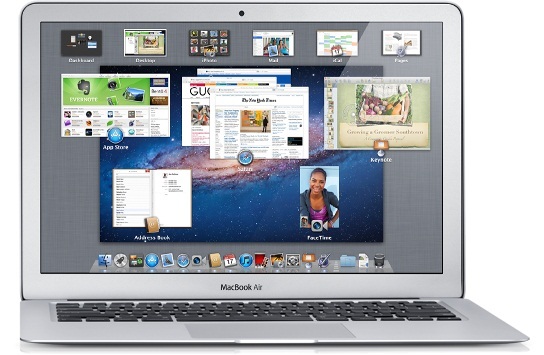 83% Apple MacBook Air 2012 13"
When the MacBook Air first came, it was the only one in its class. There weren’t any other competitors out there that could even get close to it. However, things changed a whole lot when Intel invented the Ultrabook category. We now have more than a hundred of models to choose from that could be potential MacBook air killers. Though they can feel the heat, Apple has stuck with the same design of the original Air for this current series with Ivy Bridge processors. Only a few details were changed such as the USB port. The older USB 2.0 has been replaced with a USB 3.0 port. Additionally, the MacBook Air can now be configured with more RAM and bigger storage space. The good news is: the MacBook Air already has a design that is still one of the best in today’s market. Not many of those Ultra-thin Windows laptops can come close to the perfection of the Air. Keyboard and touchpad are still the best in its class and far better than most Ultrabooks we’ve seen. The MacBook Air does lack in some areas though. The display is nice, but still has the 1440x900 pixel resolution, which is high but not as high as its bigger brother's, the MacBook Pro with retina display, and some other ultrabooks such as the Asus Zenbook Prime, too. It still lacks a memory card slot and the number of ports around the chassis is limited. The Asus Zenbook Prime and Samsung series 9 are both in the same class as the MacBook Air and in some ways better than it. Their prices are also close enough to keep the MacBook Air in the third place. Series: The original MacBook Air, “the world’s thinnest notebook” was introduced at the 2008 keynote by Apple’s former CEO Steve Jobs. Key advantages are thinness, durability, high quality display especially the input device when compare with other netbook at the time. However, it was also heavily criticized for lack of Optical Disc, only one USB port, not user-removable battery among other things. At that time, nobody knows that these disadvantages of the MacBook Air series would be the pinnacle of Intel’s concept for next generation notebooks which will be the newest trend for 2012. In 2011, Apple has introduced the latest update of the MacBook Air Series, with Intel’s latest Sandy Bridge Series, which doubling the performance. Major advantages of the 2011 MacBook Air in our reviews are the light weight, outstanding, unrivalled design and robust build quality thanks to the aluminum case, very good backlit keyboard plus glass track pad, as well as a very good performance for a subnotebook. The 2011 MacBook Air still shares some of the original’s disadvantages like limited ports, heavily reflective display, non-upgradeable memory and non-user-removable battery. Still, the MacBook Air outclasses almost every other Ultrabook out there with its advantage, save only for Samsung’s newest Series 9 model. On average, the review-ratings are very good, which always assure a place in the top 3 Subnotebook of Notebookcheck. Rumor has it that Apple will introduce the new MacBook Air within a month during Apple’s usual WWDC with Retina-display, USB 3.0 and Ivy-bridge processor, so stay tune for the newest update of the most popular Ultrabook from the tech giant in Cupertino. 3427U: Fast Ivy-Bridge-based ULV-CPU in Q2 2012. Offers a core clock of 1.8 - 2.8 GHz and an HD 4000 GPU (350 - 1150 MHz). The TDP is rated at 17 W.» Further information can be found in our Comparison of Mobile Processsors. Apple: Apple Inc. is an American multinational corporation which designs and manufactures consumer electronics and software products. Apple software includes the Mac OS X operating system but nowadays Macbooks are also able to run Windows. Apple has at least sporadically been considered the most valuable company in the world since 2011 and has consistently ranked among the Top 10 companies in the world. In the laptop sector, Apple's market share was 9.3% in 2014 and 10.3% in 2016. The latter corresponds to the 5th place. In the smartphone segment, Apple achieved 15.3% in the first quarter of 2016, which means a market share loss when compared to the 18.3% in same quarter of the previous year. Nevertheless, Apple ranked second place behind Samsung in both years. There are tons of reviews on Apple laptops, smartphones and tablets. The ratings are significantly above-average (as of 2016). 86%: This is a good rating above average. Nevertheless you should not forget, that 10-15% of all notebook-models get a better rating.